The paper, published in Astronomical Journal, is here. This entry was posted in WASP planets and tagged K2, Kepler, Nature, WASP-104b on July 19, 2018 by waspplanets. In the discovery paper the exoplanet WASP-47b was introduced to the world with the description: “With an orbital period of 4.16 d, a mass of 1.14 MJup and a radius of 1.15 RJup, WASP-47b is an entirely typical hot Jupiter”. And it did appear to be entirely typical until Juliette Becker et al looked at K2 lightcurves and found two more planets, a super-Earth orbiting inside the hot Jupiter (WASP-47e in a 0.79-d orbit) and a Neptune orbiting just outside it (WASP-47d in a 9-d orbit). Around the same time Neveu-VanMalle et al announced long-term monitoring showing another Jupiter-mass planet (WASP-47c), this one in a much wider orbit of 580 days. Thus WASP-47 was shown to host a whole exoplanetary system, one that is so-far unique. Combining all the information, Vanderburg et al deduce that the innermost “super-Earth”, WASP-47e, is not dense enough to be made only of rock. Instead it likely has a liquid or gaseous envelope (possibly water or steam) surrounding an Earth-like core. That is unlike other ultra-short-period super-Earths which appear to be fully rocky. From modelling the dynamical history of the system Vanderburg et al also deduce that the outermost planet, WASP-47c, is likely in an orbit that is in the same plane as those of the inner planets. If this were not the case then the system would not be stable. Thus they conclude that the likelihood that WASP-47c also transits its star, as seen from Earth, is relatively high, which should motivate a campaign to look for those transits. This entry was posted in WASP planets and tagged exoplanet composition, exoplanet transits, K2, WASP-47 on October 3, 2017 by waspplanets. WASP-107b is only twice the mass of Neptune but nearly the radius of Jupiter. It is thus a hugely bloated and fluffy exoplanet and one of the more important of the recent WASP discoveries, being a prime target for atmospheric characterisation (see the discovery paper by Anderson et al 2017). WASP-107b was also in the Campaign-10 field of the K2 mission, leading to a Kepler-quality photometric lightcurve. Recent papers by two teams, led by Teo Močnik and Fei Dai, have arrived at a similar conclusion: WASP-107b seems to be in an oblique orbit, rather than in an orbit aligned with the rotation axis of the host star. The conclusion comes from star spots. 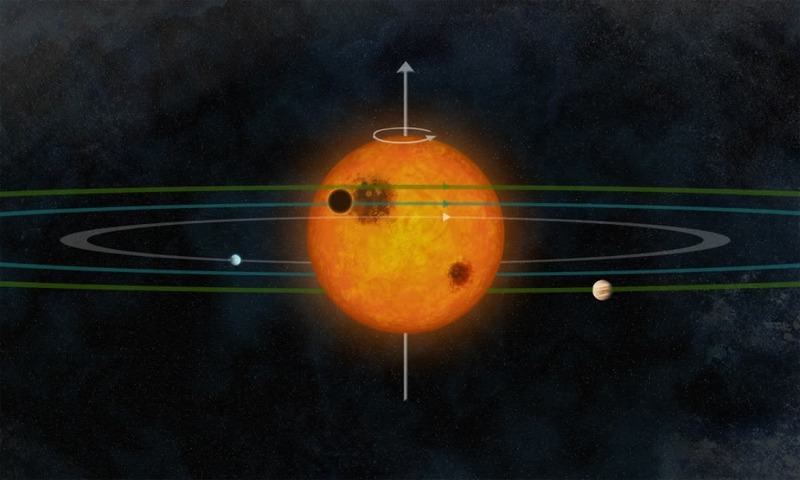 If the orbit is aligned, consecutive transits will repeatedly cross the same star spot, producing a “bump” in the lightcurve each time, whereas if the orbit is oblique this will not happen. Thus one can play the game of looking for transit bumps and seeing if they repeat. But spots can change, by growing or shrinking, so is a smaller bump in the next transit the same spot, or a different one? Also, if there is some uncertainty in the rotational period of the star, then we’re not fully sure exactly where in the next transit the spot will recur. The conclusion is that the star spots do not seem to recur and thus that WASP-107b is in an oblique orbit. This entry was posted in WASP planets and tagged K2, starspots, Super Neptune, transits, WASP-107b on February 20, 2017 by waspplanets. The K2 spacecraft is monitoring a series of fields along the ecliptic and so producing Kepler-quality photometry on some of the exoplanet systems previously discovered by WASP. The upper black curve is the raw data, while the lower red curve has been corrected for artefacts caused by drifts in K2‘s pointing. Nineteen transits are seen, recurring with the 4-day orbital period. The pulsations have a timescale of 1.9 days and a very low amplitude of 2 parts in 10 000, only discernable given a lightcurve with Kepler‘s photometric accuracy. Thus WASP-118 appears to be a γ-Doradus pulsator, possibly the first γ-Dor variable known to host a transiting exoplanet. This entry was posted in Hot Jupiters, WASP planets and tagged Gamma Dor variable, K2, pulsations, WASP-118 on February 17, 2017 by waspplanets. 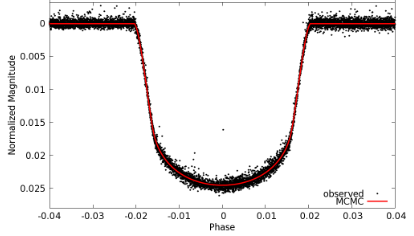 Planets transiting their star can cross a starspot, and that — since the spot is dimmer than its surrounding — causes an upward blip in the light-curve of the transit. The same starspot can be occulted in consecutive transits, and so is seen later in phase each time because the star has rotated between the transits. A starspot feature in three consecutive transits. Image by Klaus Felix Huber. Keele University PhD student Teo Močnik has looked at the Kepler K2 lightcurve of Qatar-2, a star known to host a hot Jupiter in a 1.34-day orbit. 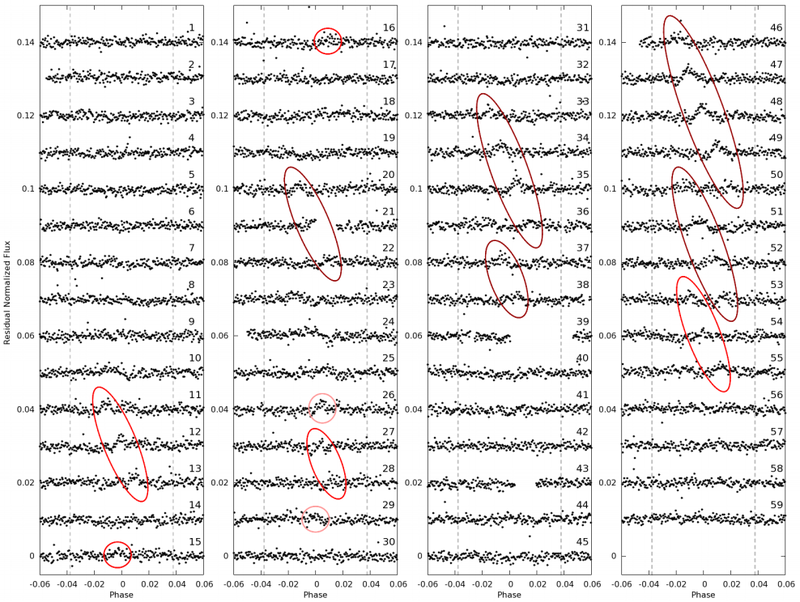 The lightcurve records 59 consecutive transits over a 79-day period and Močnik finds that most of the observed transits are affected by starspots (link to paper). In the plot below each numbered lightcurve is from a transit, which occurs between the vertical dashed lines. The transit profile itself, however, has been subtracted in order to better show the starspot features. The starspots occur in groups, shown by red ellipses, and each group is the same starspot being seen in consecutive transits. Interestingly, though, the groups of spots themselves recur. Thus the starspots are lasting long enough that they pass behind the limb of the star, and then re-appear to be transited again one stellar rotation cycle later! One particular starspot first causes the features in transits 20 to 22, then comes round again to produce the features in transits 33 to 36, and then comes round once again to produce the features in transits 46 to 50. Thus the starspot must have lasted for at least 40 days. We thus have one of the best observations yet of a starspot on a star other than our sun. From this information we can calculate the rotation period of the star, place limits on the size, position and longevity of the spots, and also show that the planet’s orbit is closely aligned with the spin axis of the star. This entry was posted in Hot Jupiters and tagged K2, Qatar-2, starspots on September 2, 2016 by waspplanets. If, during a transit of its star, an exoplanet crosses a star spot, it will be covering a region that is dimmer than the rest of the star. Since less light will be being occulted, we will see a small increase or “bump” in the transit profile. WASP-85 was recently observed by the K2 mission, getting sufficiently high-quality photometry that it could reveal such starspot `bumps”. The interesting question is whether a bump recurs in the next transit, but shifted later in phase, as it would if the same starspot is being occulted again. This would happen if the planet’s orbit is aligned with the stellar rotation. In that case, as the star rotates, the spot moves along the line of transit, to be occulted again next transit. To judge whether the starspot bumps repeat, Teo gave all the co-authors a set of lightcurves and asked them to judge which features in the lightcurve were genuine bumps. But, to avoid human bias, he first scrambled the order of the lightcurves, so that the co-authors didn’t know which lightcurve came next. 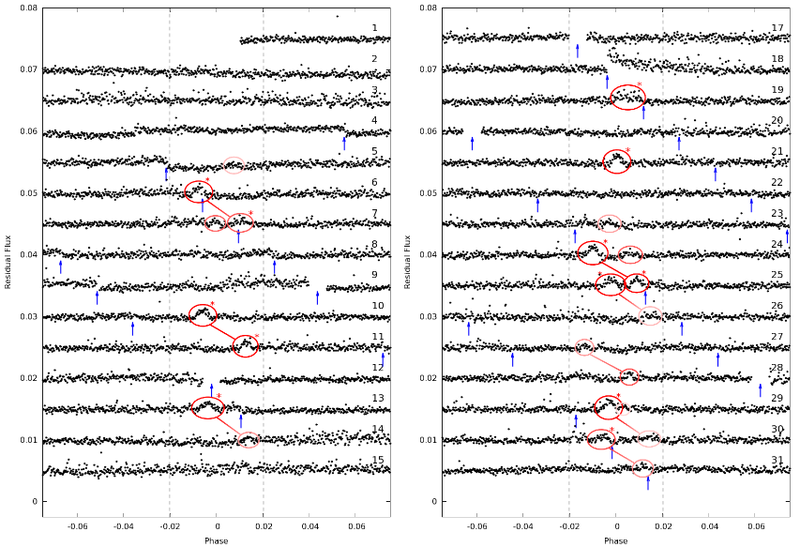 The result is that we think that starspots do repeat, shown by the red linking lines in the above figure. This shows that the planet’s orbit is aligned, and it also allows us to estimate the rotational period of the star. This entry was posted in WASP planets and tagged K2, starspots, transit, WASP-85 on April 18, 2016 by waspplanets.